This is my first tutorial for using SharpDX. 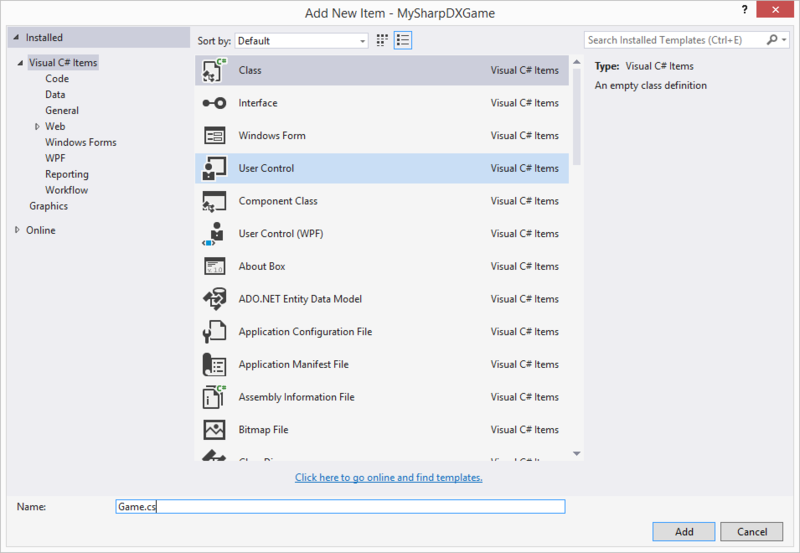 SharpDX allows you to render graphics using DirectX and C#. I recently started using SharpDX but there is not too much documentation and tutorials out there compared to other options, therefor I will be writing those tutorial as I go along. Note: For those familiar with SharpDX you might know that it exists a toolkit to get a quick setup to get started, which gives a Game class similar to what is found in XNA. In those tutorials I will not be using the Toolkit. 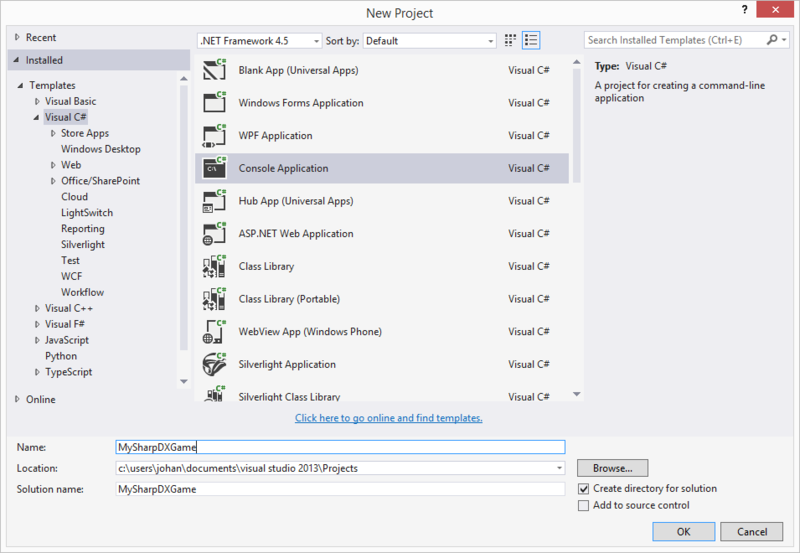 In this tutorial we will not write any code, simply set up a new project in Visual Studio and add the required references. 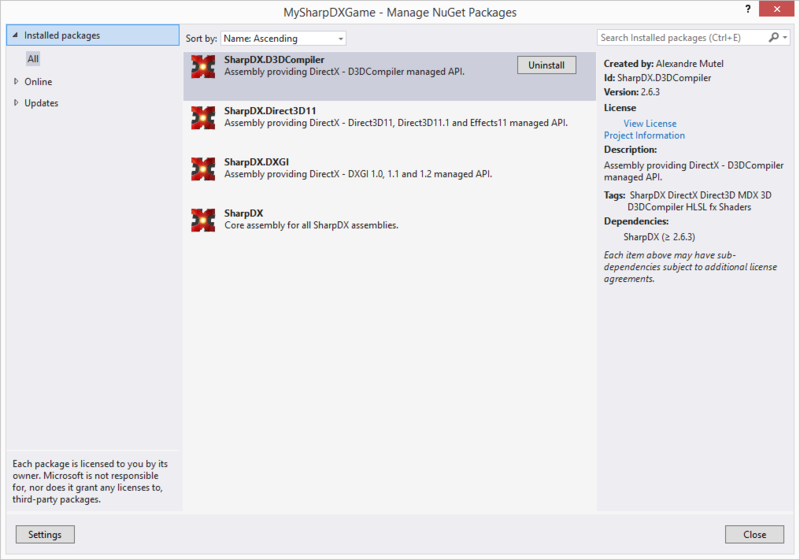 As you can see, there are many SharpDX packages available on NuGet, those we added are required to render a simple scene and compile our shaders. We now have a correct project set up, in the next tutorial we will look at creating a simple window. In this second tutorial we will look at creating a simple window which we later will render to. Firstly we will create a new class called Game. Right click the project and select “Add -> Class…”, name the file “Game.cs”. First we make the class public and then add a RenderForm along with two variables to hold the width and height of the window client size (the rendering size, does not include borders of the window). The RenderForm class also requires is to add a references to SharpDX.Windows. The RenderForm is a subclass to a Windows.Form provided by SharpDX. This class, just like Windows.Form, provides us with a window that has borders, title bar etc. But it also provides us with a render loop which is optimized for 3D graphics. If you want to know more about this, take a look at the SlimDX (another wrapper similar to SharpDX) documentation: http://slimdx.org/tutorials/BasicWindow.php. Next we will add our constructor to the Game class which creates the RenderForm. We also need to add a reference to System.Drawing. We will also set a title and disable the user from resizing the window. We pass in our RenderForm and method to be called each frame to the RenderLoop.Run(…) method. Here we also make sure to dispose our RenderForm. Because Game implements IDisposable it will automatically be disposed correctly due to the using statement. Read more about how this works here: https://msdn.microsoft.com/en-us/library/yh598w02.aspx. That was all for this tutorial, in the next part we will look at initializing the Direct3D device and set up a swap chain. In this part we are going to initialize DirectX. The first 2 parameters are the size of the back buffer, which in most cases should match the client width/height of the window we are rendering in. The third parameter is the refresh rate in Hz (hertz), we set this to 60/1 = 60 Hz. The last parameter is the format of the back buffer, here we specify a format with a red, green, blue, and alpha channel using 32-bit unsigned integer. For a complete list see the MSDN documentation for DXGI_MODE_DESC. ModeDescription: Here we provide our back buffer description. 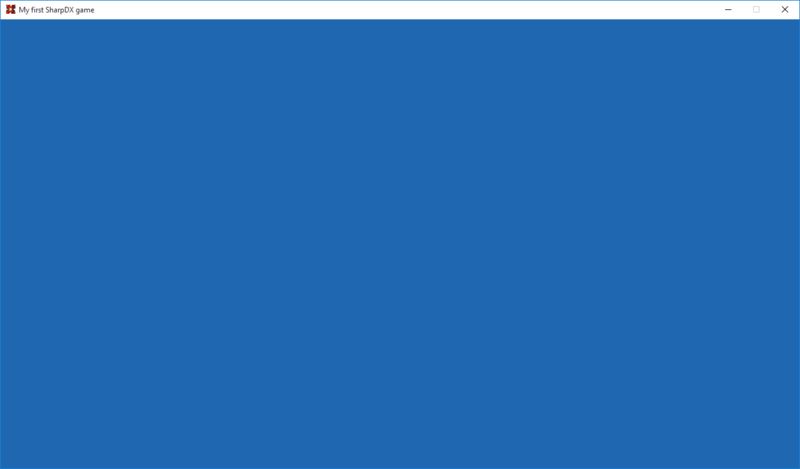 SampleDescription: This is a descriptor for multisampling, we just specify one level (no multisampling) See DXGI_SAMPLE_DESC on MSDN. Usage: Specify if/how the CPU can access the back buffer, as we are rendering to it we specify it as RenderTargetOutput. For other options see MSDN for DXGI_USAGE. OutputHandle: Handle to the window to render in. BufferCount: Number of buffers, we just need 1. IsWindowed: Wheather we want to be in fullscreen or windowed mode. 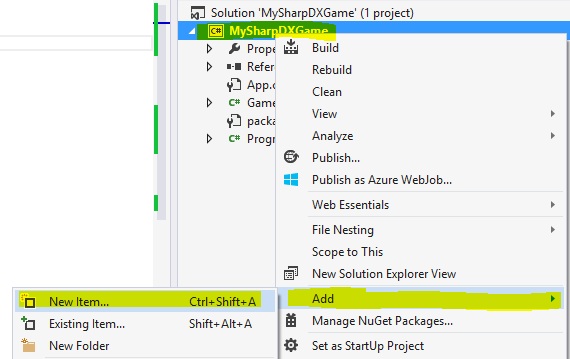 Those are all we need to set right now, for the rest of the options, see DXGI_SWAP_CHAIN_DESC on MSDN. We also added using D3D11 = SharpDX.Direct3D11;. We use this notation to avoid name conflicts between classes, and avoid having to write the full name, e.g. SharpDX.Direct3D11.Device. The first parameter specifies that we want to use the GPU. We choose to not use any special flags, for possible flags see D3D11_CREATE_DEVICE_FLAG on MSDN. Third parameter is our swap chain descriptor. The last parameters are in which variables we want to store our swap chain and device in. We also get our device context from the device. We get can get this from the swap chain by specifying which type of back buffer we want, in our case a Texture2D. Then we create a render target view from it, which we will soon use. This code first sets the active render target view to the one we just created. Then it clears the render target view (currently our back buffer) and then swaps the back with the front buffer, making the back buffer visible. By specifying 1 as the first parameter to Present(…) we wait for vertical sync of the monitor before we present. This will limit the FPS to the update frequency of the monitor. 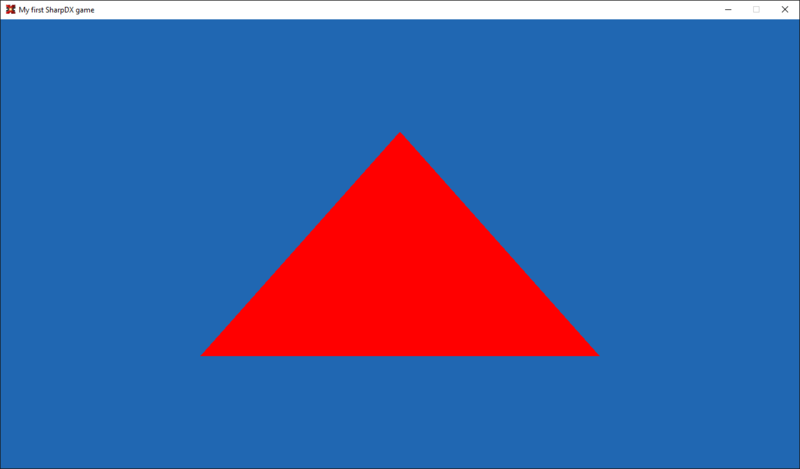 Now that we have a window with Direct3D initialized it is finally time to draw something, and just as all other tutorials out there, we will also start with drawing a triangle! To render our first triangle there are actually quite many parts we must add, so let’s get started. To create the triangle, we will use vertices. A vertex is an exact point in a 3D space, which can also hold additional information (which we will see in later tutorials). For now, our vertices will only be represented by 3 values, its x, y, and z-coordinates. The vertices array we just created is stored in the system memory, but for rendering our objects we will need to transfer the data to the video memory. For this we will use Buffers. In DirectX we have three different types of buffers, Vertex, Index, and Constant buffers. The data in buffers are automatically copied from system memory to video memory when we our rendering needs the data by DirectX. Here the method D3D.Buffer.Create<T> is used to create a new buffer, the generic type parameter T specifies of which data type of each element in the buffer. The first argument is the Direct3D device we wish to use. The second argument is which type of buffer we want to create, in this case a vertex buffer. Lastly we provide the initial data to load into the buffer, in this case our array of positions. The graphics pipeline in DirectX 11 consists of several programmable steps. Now we will focus on the Vertex Shader Stage and Pixel Shader Stage. The vertex shader stage is responsible for processing vertices, this can include for example transformations (translating, rotating, scaling, etc). The pixel shader stage processes runs for each pixel, and received interpolated per-vertex data, as well as constant variables and textures. This shader is run for each pixel of the rendered primitive, and should return the final color of the pixel. Here we first point at which files to compile, vertexShader.hlsl and pixelShader.hlsl. We also specify the name of the entry point method in the shader code, “main”. Then we also set which version of HLSL to use, in this case 4.0. Finally, we also set the compilation to debug mode. Here we also set the primitive topology, this specifies how the vertices should be drawn. In this case we will use “Triangle List”, we will use other types in later tutorials, but you can check out the MSDN documentation for a good illustration of the different types. 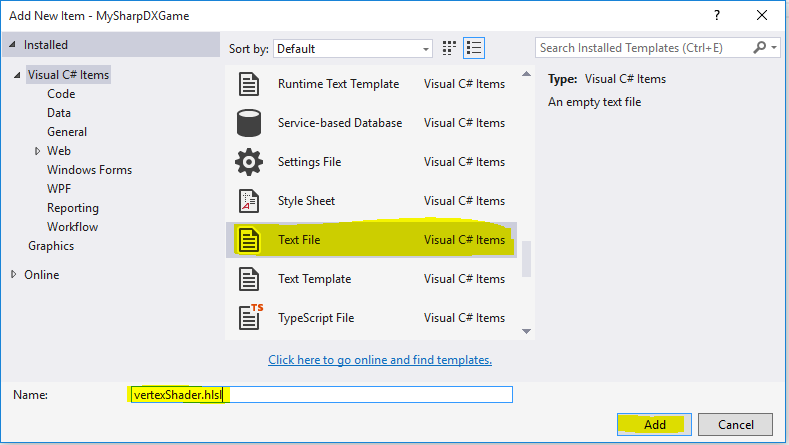 Find “Text File” and enter “vertexShader.hlsl” as name. Press Add. Select the file in the solution explorer, and in the Properties window, set “Copy to Output Directory” to “Copy Always”. Repeat step 1-3, but name the file “pixelShader.hlsl”. Here we create our entry point method “main”, as we specified earlier. To start with the method only returns the same position that it gets from the vertex buffer. Notice the “: POSITION” and “: SV_POSITION”, this is called a semantic and specifies the intended use of the variable, we will see more of why this is important later in this tutorial. Again we create a main method, the parameter to the method is the output from the vertex shader. But remember that the vertex shader is run for each vertex, while pixel shader runs for each pixel, so this will be an interpolated position. From this method we return a float4, which is our color in the format red, green, blue, alpha. So this will produce a red color for all pixels. Worth noting is that the values in the float4 is between 0 and 1, so float4(0, 0, 0, 1) would give black, while float4(1, 1, 1, 1) would give a white pixel. We now have a vertex buffer which has our vertex data. But DirectX also wants to know about how the data is structured and of what type each vertex element has, for this we use an Input Layout. This requires two step. First we need to describe each element in a vertex, and then create an input layout from that. The “POSITION” can be recognized from the shader code, this is called a semantic and is used to match with the input signature in the shader. The second parameter is which semantic slot to use, this is used if you have multiple POSITION semantics for example. Thirdly is the data type of this element, in this case 3 floats as the position for our vertices is Vector3. And then assign it at the end of the InitializeShaders() method by creating a new InputLayout instance. Then we set this as the current input layout on the device context. The first element is our Direct3D device, and then our input signature from the shader and lastly the input elements array. Before we draw anything we have to specify the viewport. DirectX uses something called Normalized Device Coordinates, specified as (-1, -1) in upper left corner, and (1, 1) in lower right corner (and therefore (0, 0) in the middle) of the screen. The viewport maps those corners to pixel coordinates. The first two parameters are the x and y position of (-1, -1) and the last two parameters are how the width and height of the viewport. As we want to use the full window we map it tell it to start in the upper left corner (0, 0) and set it to the full width and height of the window. The first method tells the device context to use the vertex buffer holding the triangle vertex data, with the second parameter specifying the size (in bytes) for the data of each vertex. To get this size we use a nice helper method available in SharpDX. The Draw() method on the device context draws vertices.Count() many vertices from our vertex buffer. The second parameter specifies the offset in our vertex buffer, by settings this to 1 for example, the first vertex would be skipped. In December 2015, SharpDX 3.0.0 was released, followed by 3.0.1 in January 2016. This new version features several major changes, as well as some new features. For example, the assemblies are now more light weight by for example moving mathematics to a separate assembly. SharpDX now also supports Direct3D12 (requires Windows 10). What’s removed and when shouldn't I upgrade? But while Direct3D12 is now present, Direct3D10 has been removed, along with the toolkit. SharpDX 3.0.0 also requires .NET 4.5, so if you can’t use that, you will have to stay on 2.6.3. Some pretty nice helper functions, such as Texture.FromFile(...), which allowed easy loading of textures from files are also no longer supported (I will cover how to load textures in a later tutorial). 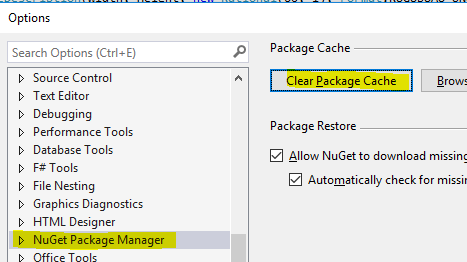 Go to “Tools” -> “NuGet Package Manager” -> “Package Manager Console” to open the NuGet console. This will also update SharpDX and SharpDX.DXGI to 3.0.1, because SharpDX.Direct3D11 depends on those. Build the project again, it should now compile and run correctly, but now with SharpDX 3.0.1. NuGet says there are no updates are available? No updates available for ‘SharpDX.Direct3D11’ in project ‘MySharpDXGame’. Re-run the commands in the console, it should now update correctly. This concludes tutorial 4.5. All the tutorial sources on GitHub have now already been updated to SharpDX 3.0.1, so if you download the code there you won’t have to do those steps yourself. In part 4 we created a triangle, and we could set a single color for the whole triangle in the pixel shader. 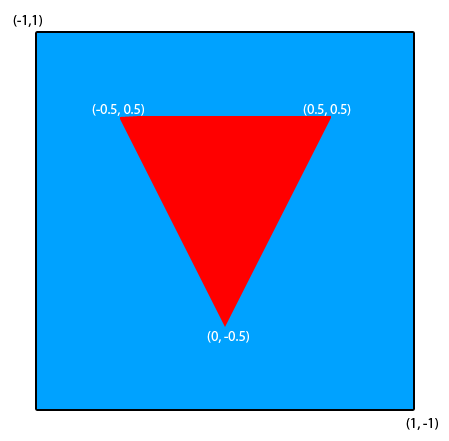 In this tutorial we will see how we can add a separate color to each vertex of the triangle. We will continue working on the code from the previous tutorial, which you can also find here. So, now we have an immutable struct which has both a Position and Color. We also added the [StructLayoutAttribute(LayoutKind.Sequential)] attribute to the struct. This make sure that the values are laid out in memory in the same order as they are specified in the struct. This is important as we later need to tell this to the GPU. Now the compiler will infer that it is a <VertexPositionColor> from the arguments automatically instead, so if we later change it we won’t need to change here again. We added another InputElement, where the type is a R32G32B32A32_Float, because the SharpDX.Color4 struct we used in our vertex struct contains 4 floats (in RGBA order). We also add a few other arguments, most are irrelevant right now, except the 4th, where we specify 0 for “POSITION”, but 12 for the “COLOR” element. This argument is the offset in the structs where this data starts (in bytes), and because the position comes first it has offset 0, and each position is a Vector3 which contains 3 floats (x, y, z) of 4 bytes each = 12 bytes. So therefore the color data will be found after 12 bytes. from the end of InitializeDeviceResources(), and place it first in Draw() instead, as it has to be called at the beginning of each frame.